I grew up using the New York City subway system. In 1956, I could ride nearly two hours from my home in Flushing to the beach in Coney Island for 15 cents. Today, the fare has inflated to $2.25, but the rides is still unlimited in distance and duration. 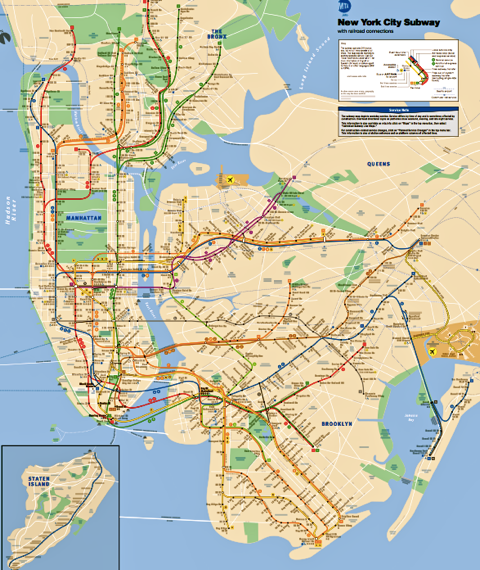 With the total track of 842 miles, the NYC subway system is huge. New York City developed various public rail transportation in the late 1800s, and the electrified underground subway system began construction in 1904. 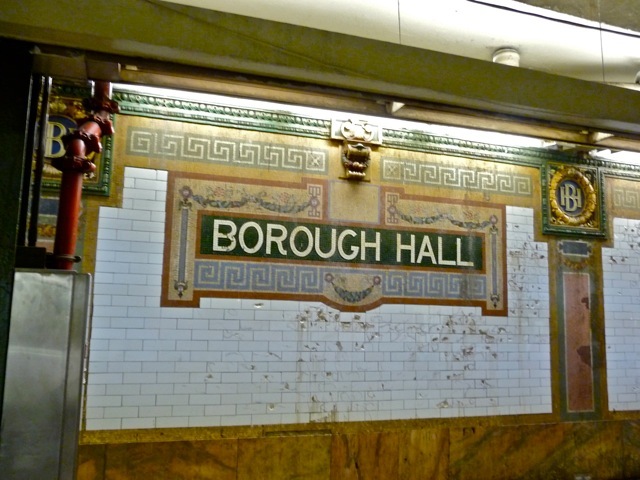 This 100-year-old mass transit system serves New Yorkers well. Many New Yorkers never learn to drive since the public transportation system carry them everywhere they need to go. 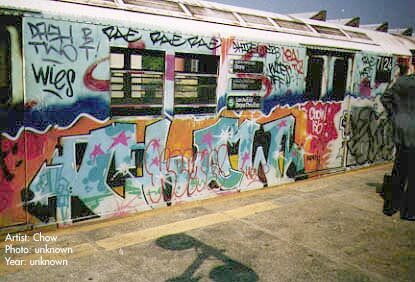 In the rebellious 1970s, the subway system was hit by a plague of graffiti. 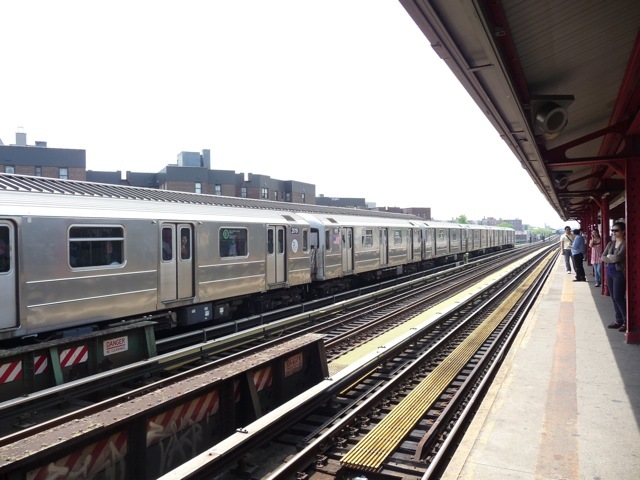 Subway cars and stations were covered by spray painted graffiti, overwhelming the cleaning crews. It felt unsafe to ride the subway in the out-of-control, oppressive and intimidating atmosphere. Some art critics claim the graffiti is a form of public art. To me, their statements lack credibility unless they invite these “artists” to decorate their homes. In contrast, the new MTR system in Hong Kong is a model of clean, comfortable, air conditioned conveyance. 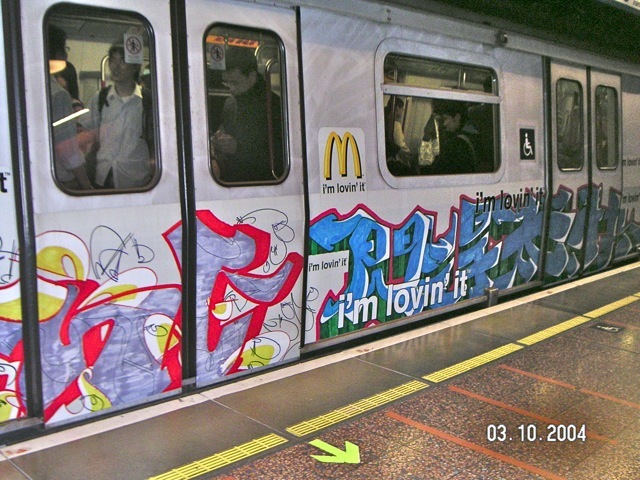 I was dismayed one day when I saw graffiti on the MTR cars which turned out to be advertisement for McDonald. The ad agency had a twisted sense of aesthetics and offered an open invitation to vandals to ruin a good thing. 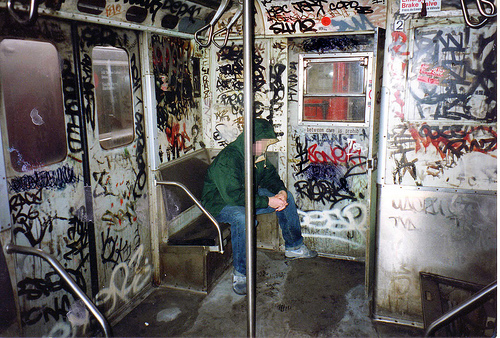 It took the cleaning crews 20 years to rid the New York subway of graffiti. By cleaning a little faster than the vandals could deface the cars, the cleaning crews stubbornly transformed the dirty cars into sparkling, pleasant vehicles. 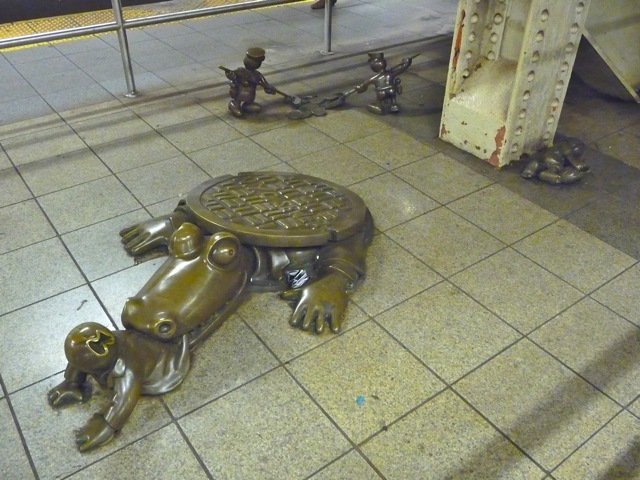 Sometimes, vandals caught defacing the subway were sentenced to clean their own graffiti. 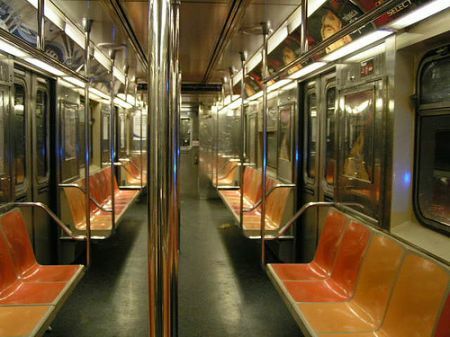 The exterior of today’s subway cars gleams. But the miles of tunnels and tons of garbage make the subways underground an ideal home for animals. 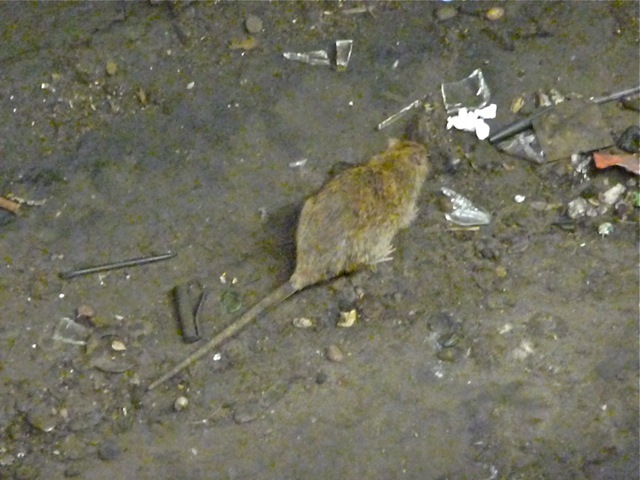 This rat scampers on the tracks of one station. 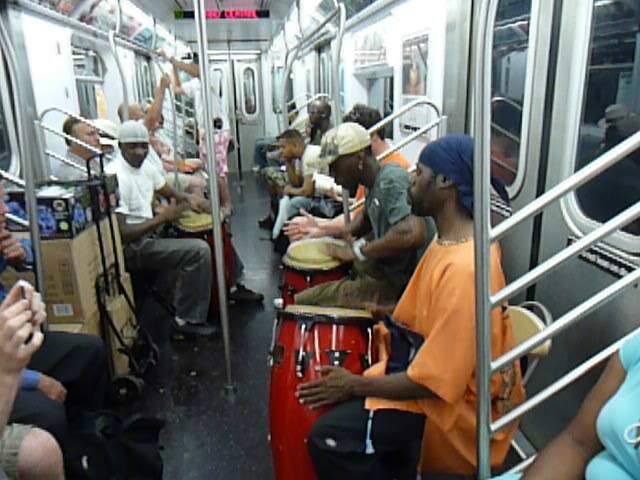 Frequently, subway riders are involuntarily entertained by roving musicians. Typically, only about 5-10% of the riders would donate money to them. 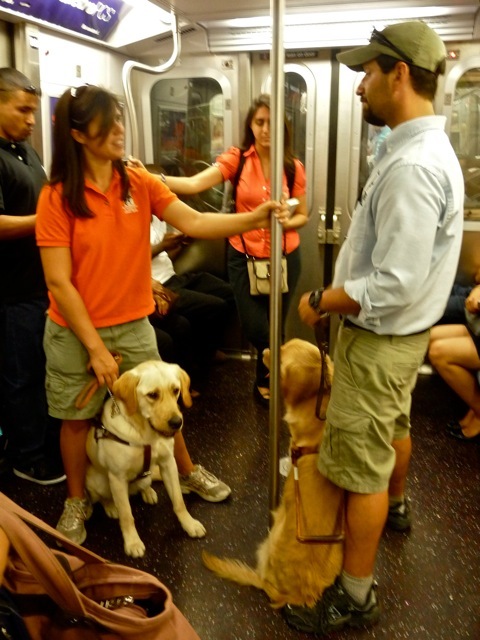 Guide dogs go wherever their blind masters need to go, and they ride the subway in New York. These two lovely dogs are being trained to get used to the noise, crowds, and the undulating trains. 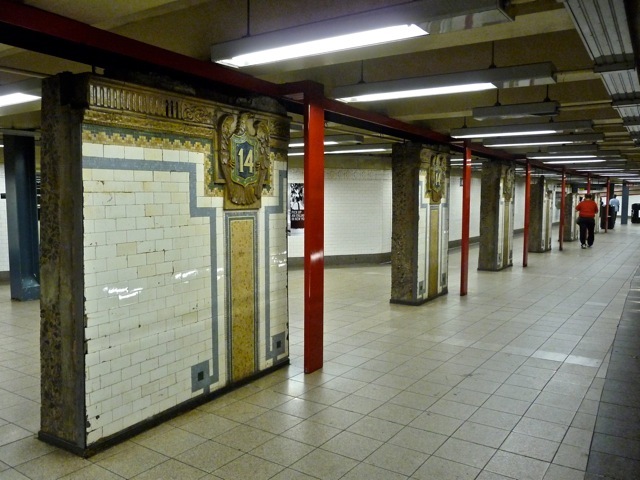 The subway stations built in early 1900s were decorated with glazed tile mosaics. To me, they are beautiful works of art. 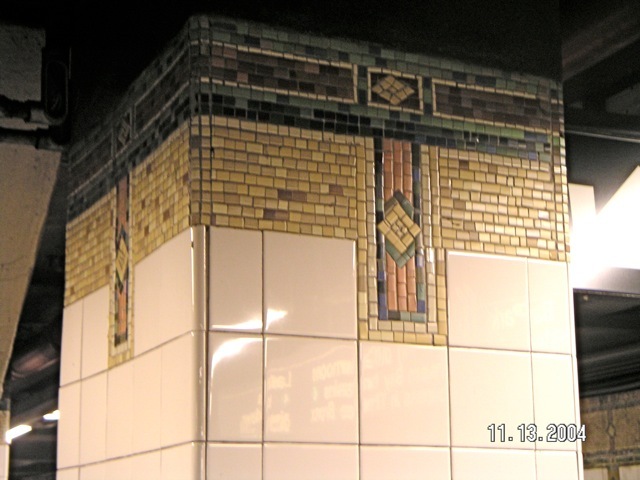 This elaborately piece of mosaic stays intact even as the surrounding tiles begin to crumble. 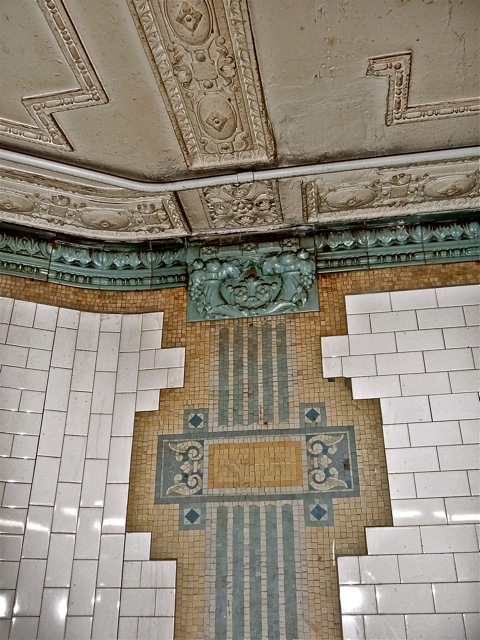 Plaster moldings for the ceiling, glazed tile moldings, and gracefully patterned mosaic are found in one station. 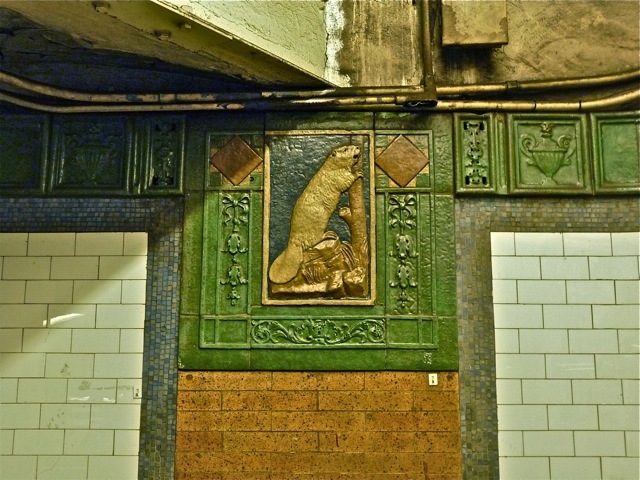 This composition has a tile with the picture of a beaver. As I make ceramics tiles featuring flowers, I appreciate the beauty of this tile. 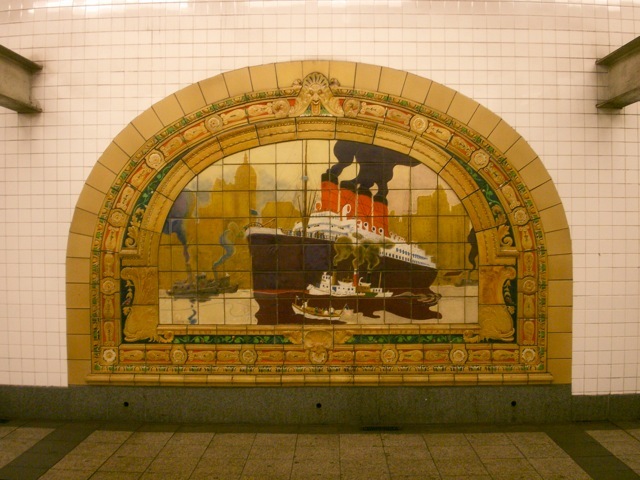 In one old station, the large composite picture of the New York harbor in the 1930s is made with dozens of glazed tiles. The underglaze painting on each tile is perfect, and the whole scene reflects the busy harbor. 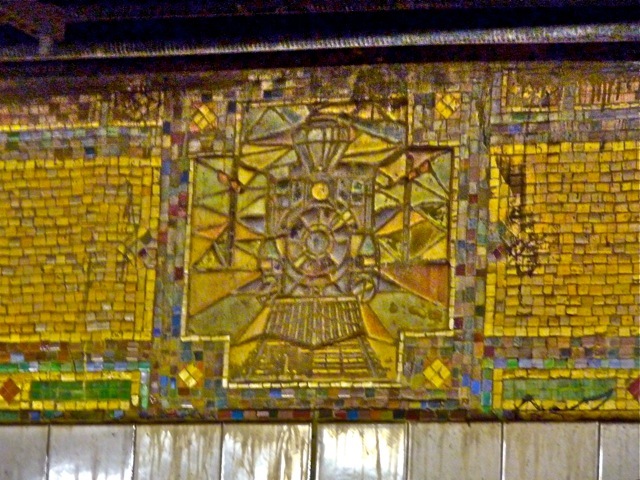 The Grand Central subway station has intricate mosaics of steam engines. While the subway trains were all electric, the steam engine credits the neighboring Grand Central railway terminus. As time wears down the infrastructure, the stations are periodically renovated. But the city wants to remember the beauty of the old decorations. 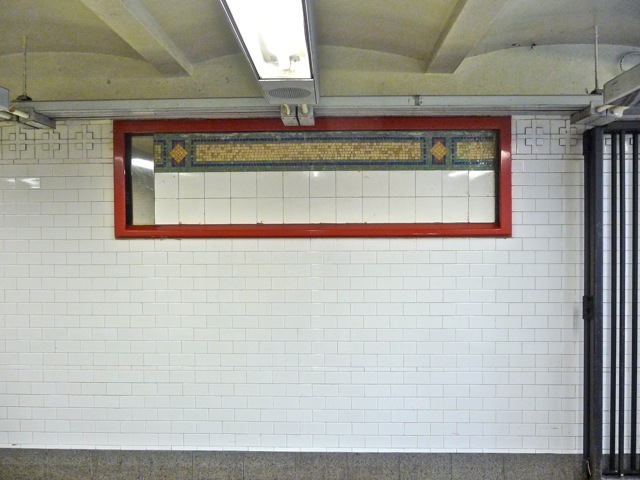 This frame showcases the old tile work under the newer, plainer white tiles. 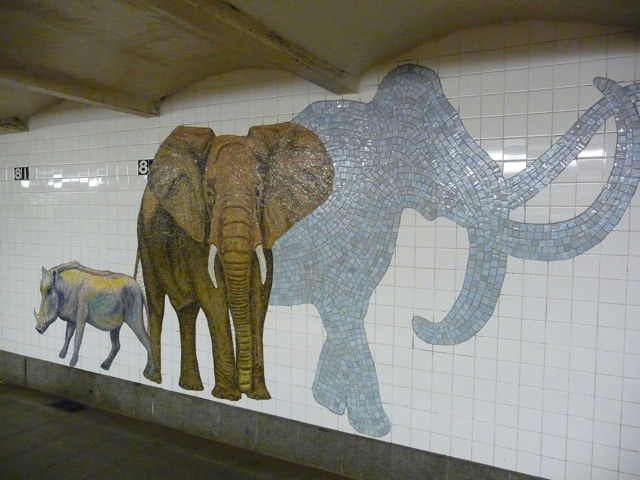 In 14th Street station, entire sections of the old wall and mosaic remain in the refurbished station. 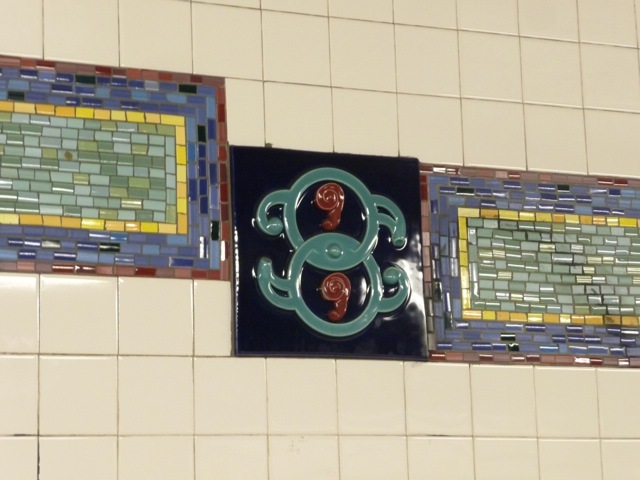 The Canal Street station near Chinatown has Chinese-inspired motif in its new tile work. New does not translate automatically to plain or tasteless decorations. These life-sized mosaic of people blend into the traffic of this busy station. Other mosaic reflect the artistic taste of the current generation. 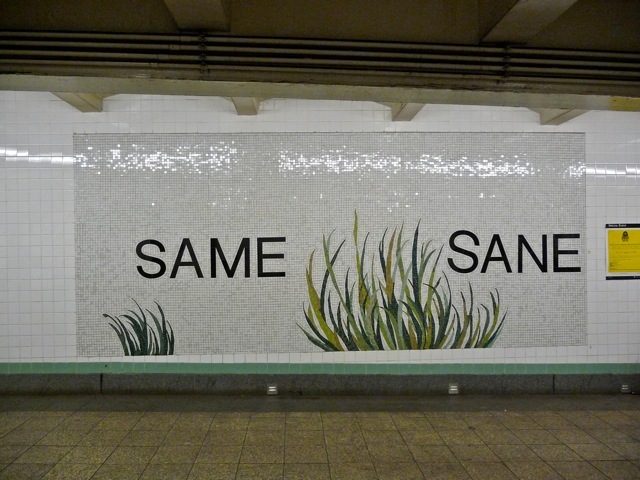 This picture lacks the refinement of the old mosaics, but it conveys a message. 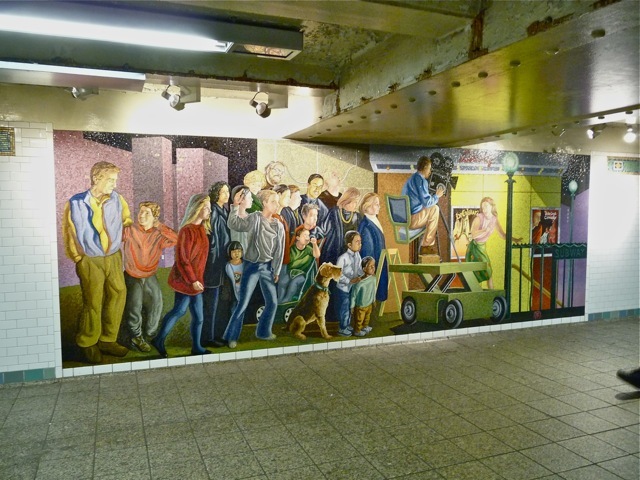 Other mosaic are detailed and good rendition of life in New York. This picture shows a crowd of spectators at a movie filming set in the subway. 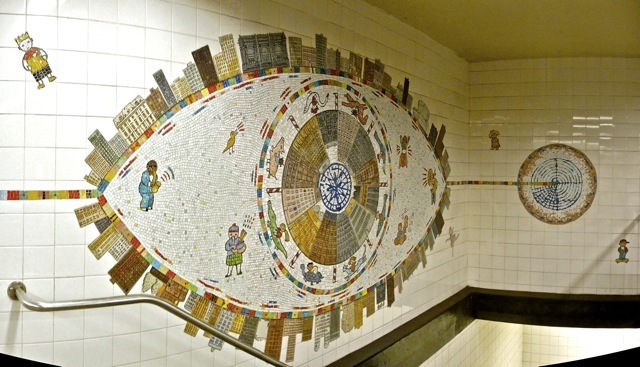 This mosaic is a colorful, fluid works of art. Another one is a simple, well-made work with a message. 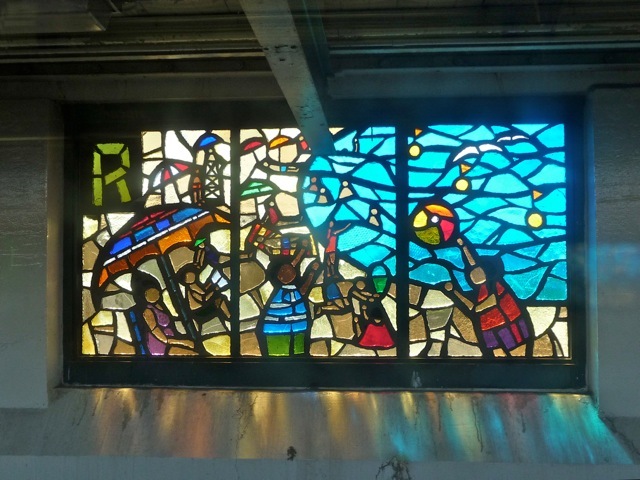 Some stations feature new stained glass pictures set in cement latticework. These bronze articles are displayed in one station and remain free from vandals, helping to build confidence that New Yorkers are law abiding citizens. 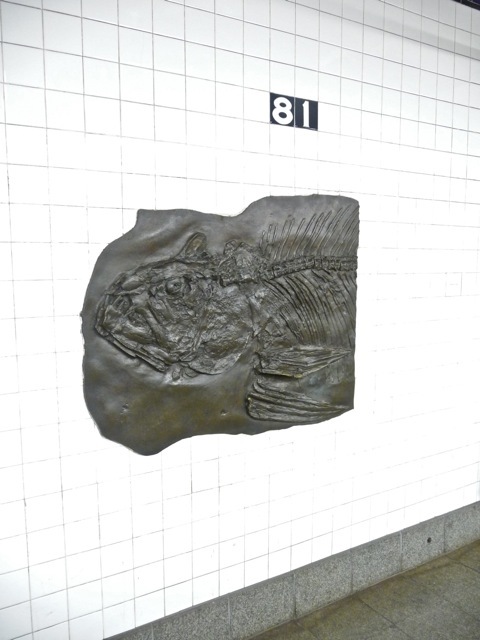 I was surprised to see large bronze reproductions of fossils as my train pulls into one station. 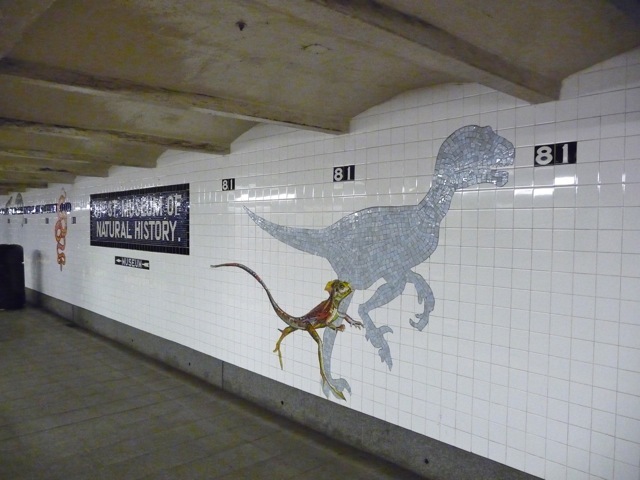 The entire skeleton of a dinosaur is reproduced in bronze and imbedded in the wall. 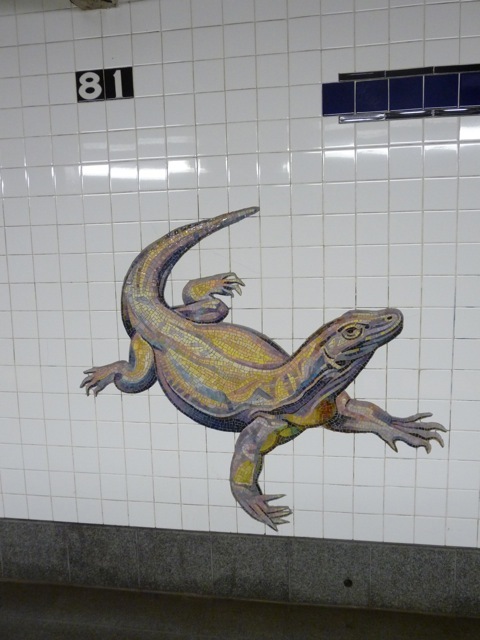 On another platform, a colorful mosaic of a Komodo dragon lumbers out of a wall. An elephant shares the wall with the silhouette of an extinct monmouth. 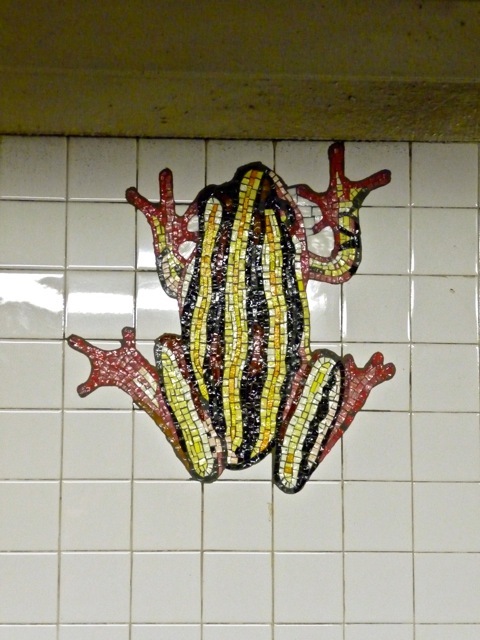 A large colorful frog clings to the wall. 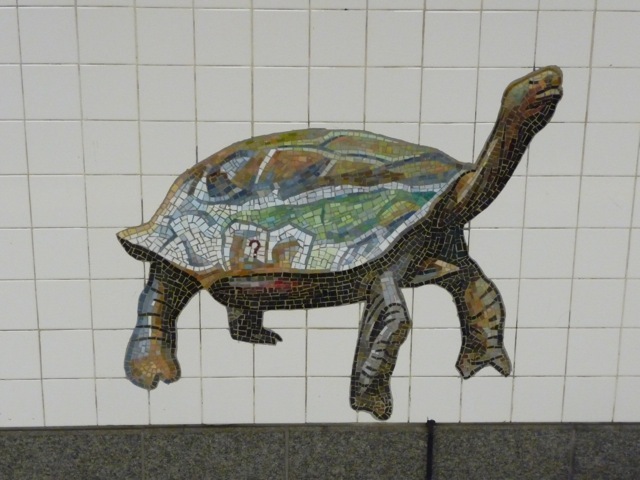 The mosaic of a tortoise has a question mark on its side. Is it a question about its survival in a fast changing world? A lizard runs alongside the silhouette of a velociraptor. 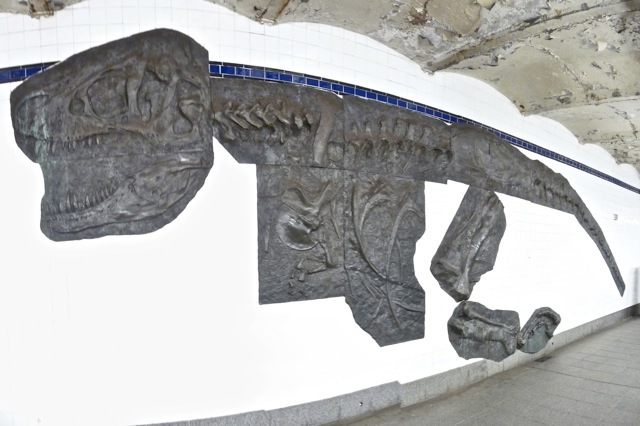 This station on 81st Street leads to the American Museum of Natural History where I spent many happy days as a teenager. The bronze copies of fossils and the colorful mosaic are enticing invitation to this great museum. 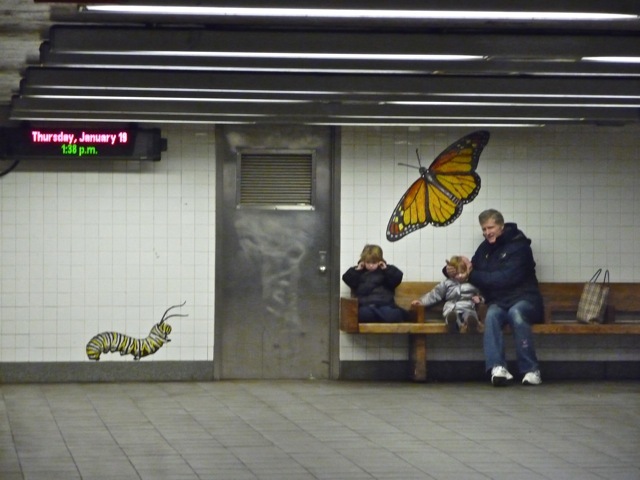 At one end of the station, a father sits with his two children next to the mosaics of a monarch butterfly and its caterpillar. They are enjoying New York as I do. Posted by Robert Wu on Tuesday, February 7, 2012, at 10:45 pm. Filed under Uncategorized. Follow any responses to this post with its comments RSS feed. You can post a comment or trackback from your blog.